We’d love your help. Let us know what’s wrong with this preview of Walter's Wonderful Web by Tim Hopgood. To ask other readers questions about Walter's Wonderful Web, please sign up. Great book that will teach children that you have to keep trying even if you become discouraged. Maybe it's the naturalist in me, but this has to be my favorite book about shapes. It's books like this that makes me so appreciative of authors that can take a topic that has been used in every sort if way, yet, they have created something fresh and original that even us adults will love. Super cute. My two year old loved it. A staple of any early sharing library is a book about shapes. Love them or hate them, you are going to be reading a lot of books that talk about circles, triangles and squares. Making shapes appealing to a young toddler or baby is one thing, but what about the poor adult? Are there not any books out there that have a bit of a story as well as talk about shapes? Usually I would not condone spiders, but in the case of a spider called Walter, I may just be able to stomach them as he combines shapes A staple of any early sharing library is a book about shapes. Love them or hate them, you are going to be reading a lot of books that talk about circles, triangles and squares. Making shapes appealing to a young toddler or baby is one thing, but what about the poor adult? Are there not any books out there that have a bit of a story as well as talk about shapes? Usually I would not condone spiders, but in the case of a spider called Walter, I may just be able to stomach them as he combines shapes with a fun story. All spiders like to make webs and Walter is no exception, it is just that whenever a small gust rises, his webs blow away. What is the best shape that Walter can make his web into so that it remains secure no matter the weather? Join him on a webby adventure that combines basic engineering with learning your shapes – how is that for learning 101! 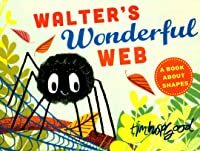 In many ways ‘‘Walter’s Wonderful Web’’ by Tim Hopgood is a very classical feeling children’s book. It has a vintage style to the illustrations and the story is all based around the classic subject of shapes. You must remember that things become classic for a reason and Hopgood evokes the best of these times by giving a timeless appeal to his book and does not fall into the trap of being overly wordy and boring. This is a book that explores shapes in a context that is interesting, informative and fun. It also comes on extremely sturdy cardboard that means it was made to last. Using the web as a basis for shapes makes sense; every couple of pages, or so, Walter tries out a different shape. An older baby or young toddler will be able to see the shape and learn from the book, but Hopgood goes one step further to entertain the slightly older reader. 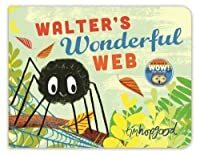 Whenever Walter’s web flies way it teaches the basics as to what makes a strong structure; this combined with the story of Walter’s struggle means that this is not just a shape book for the very small, but also for up to around 4 years. A delightful book that will educate your children on shapes and perseverance. I appreciated how this book showed that if you try and try again, you can persevere and succeed. While showing children what perseverance is, this book subtly educates children about shapes as well. I believe that children will love this book and I cannot wait to read this during a story time or program at the library; I can picture it now! Walter's wonderful web is a great story about never giving up. Walter tries many times to build a web that will be strong enough to withstand the windy forest. He tries many shapes to come up with his sturdiest creation. The book introduces kids to shapes and invites the readers to guess what shape walter will create next. Great book for preschoolers. Walter's wobbly webs keep getting blown away by the wind. He tries building triangle webs, square webs, rectangle webs, diamond webs, and circle webs, but they all get blown away. Then Walter builds a wonderful web... one with all the shapes included. Adorable. Will build a PreK shapes lesson around this. The spider builds his web over and over again which provides a great introduction to shapes. Yet it is also an inspiring book about not giving up and finding a solution. Tim Hopgood's concept books are great for toddler storytime. I love his bright, bold, fun illustrations. A great lesson on shapes "woven" into this book about Walter who will not give up on building the perfect spider web. Lovely art work. Nice little story introducing shapes. This picture book is great introduction to shapes. It's a bit too long for toddler storytime, but would be a great fit for preschool. Nice idea, big and bold illustrations that will be easy for kids to follow. It was missing something that I can't quite put my finger on. A smidge more substance, maybe? It did get a little repetitive, and I also kept wondering why (especially as Walter gained more confidence) his webs would always be destroyed and none of the other spiders' were. But this is a book on shapes, and not engineering. Concept. 2016. Walter's Wonderful Web is a great book for introducing or reviewing shapes in elementary grades. To build a strong web, Walter has to figure out which shape(S) make the best web. Walter never gives up on building his web which I would make sure to point out when reading this story again with kids. This was a great lead into a simple craft- I gave out darker blue paper and had the kids draw their own webs with white crayons. You could complicate it more (additional colors, pre-cut shapes), but today it worked great. I did this at lapsit with foam shapes. The kids did much better with their shapes than I thought they would. There was some confusion between squares & rectangles (I skipped over diamonds), but it's a good thing for them to learn. Great for preschool story time on shapes or spiders. Love Tim Hopgood for my preschool crowd. This is an excellent book to work with shapes. You can also use this book for sequencing. Children will love Walter. Such a sweet book about shapes! Walter is *adorable*. The illustrations are fun and energetic and the story is very engaging. It was a fresh take on a story about shapes and determination. A great way to integrate shapes into a story. Like the moral about persistence too. wonderful read on shapes, spiders, resilience, interactive, would be good for preschool storytime. can ask them questions like what shape is this? The shapes were a big hit! Gives a simple introduction to shapes while also teaching about persistence when you don't succeed the first time. Probably not super accurate regarding spiders and web spinning.